Organic spring mix salad w/ cucumbers, cherry tomatoes, carrots, green onions, cranberries, and classic Italian dressing. Crisp romaine salad w/ homemade caesar dressing. Organic fresh spinach w/ bacon, candied walnuts, hard boiled eggs, cherry tomatoes, feta cheese & classic Italian dressing. Fresh arugula salad w/capers, smoked salmon, cherry tomatoes, goat cheese, and lemon vinaigrette. Toasted bread topped with roasted bell pepper, italian parsley, and melted mozzarella. Thin sliced beef w/ capers, red onions, shaved parmesan, and lemon vinaigrette. Deep fried calamari with our homemade dipping sauce. Grilled eggplants filled with goat cheese baked. Finished with caramelized red onions, capers, & balsamic vinegar reduction. Asparagus wrapped‏ in prosciutto and provolone cheese. Baked on top of toasted bread. 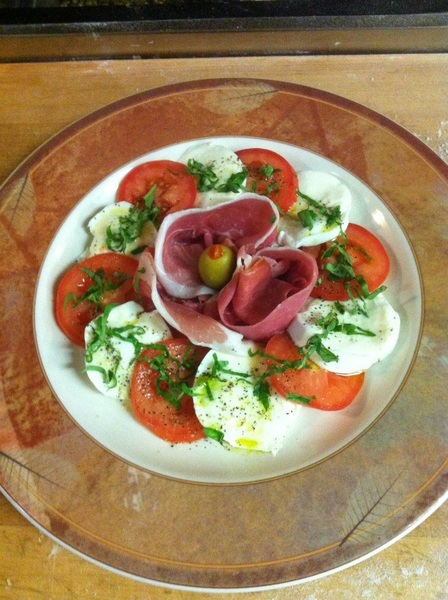 Bufala mozzarella, organic tomatoes, fresh basil, E.V.O.O., and parma prosciutto. 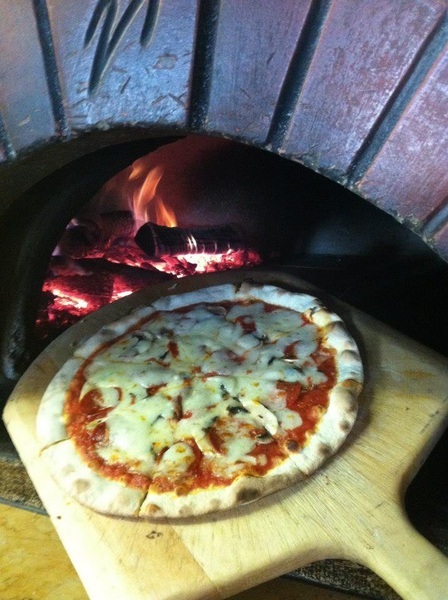 Tomato sauce, mozzarella cheese, and basil. Tomato sauce, italian sausage, and mozzarella. White sauce, pesto, artichokes, arugula, fetta, and mozzarella. Tomato sauce, smoked prosciutto, mushrooms, and mozzarella. Tomato sauce, grilled zucchini, bell peppers, mushrooms, artichokes, and mozzarella. White sauce, pesto, spinach, chicken, and mozzarella. White sauce, smoked salmon, capers, red onions, tomatoes, goat cheese, and mozzarella. Tomato sauce, sausages, mushrooms, bell peppers, artichokes olives, and mozzarella. Tomato sauce, smoked prosciutto, mascarpone, and mozzarella. Tomato sauce, Italian sausages, pepperoni, bacon, mushroom, and mozzarella. 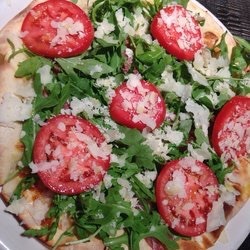 White sauce, ‏prosciutto, arugula, fresh tomatoes, parmesan, mozzarella, and truffle oil. Spaghetti with garlic, roasted chicken, white wine, pine nuts, raisins, spinach, and parmesan. Spaghetti with garlic, tomato, marinara sauce, and basil. Spaghetti with pancetta, olive oil, eggs, and parmesan. Meat lasagna with bolognese, besciamelle, and parmesan. Round raviolis filled with ricotta, porcini, and wild mushrooms. 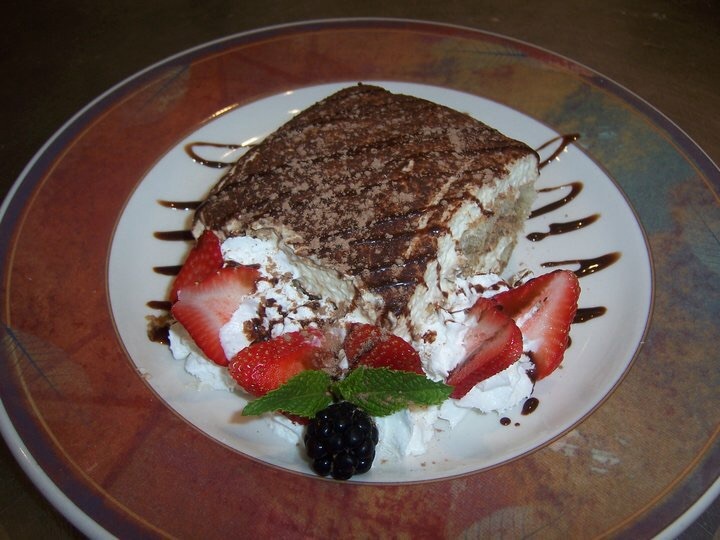 In a black truffle cream sauce finished with parmesan cheese and white truffle oil. 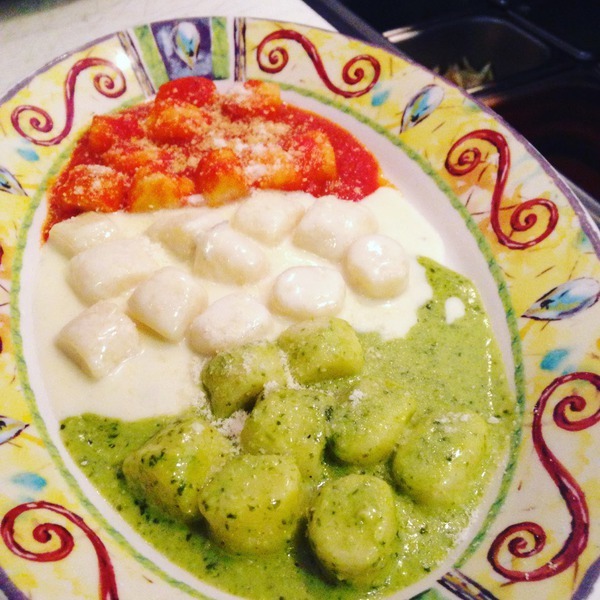 Potato dumplings‏ in 3 different sauces 1/3 marinara 1/3 pesto 1/3 gorgonzola. Potato dumplings with bolognese meat sauce. Baked potato dumplings in a garlicky marinara sauce topped with smoked scamorza, basil, buffalo mozzarella, and parmesan. Fettuccine with Italian sausage, red pepper flakes, pancetta, gorgonzola, white wine and marinara sauce. Fettuccine with yellow onions, chopped prawns, and bay shrimp. In a vodka tomato cream sauce. Fettuccine with onions, mascarpone, crimini and porcini mushrooms. In a creamy white wine sauce with truffle oil. 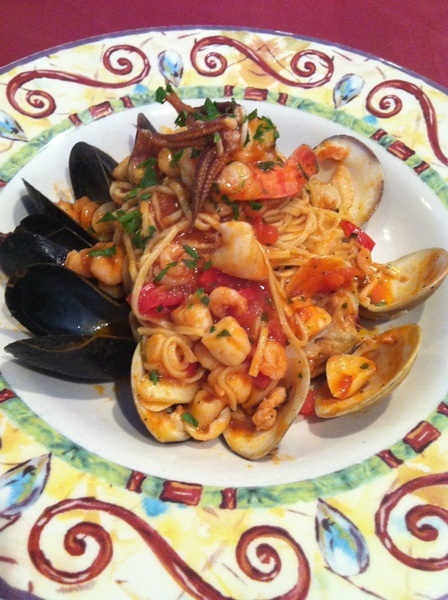 Spaghetti with mussels, clams, scallops, prawns, bay shrimp, calamari, and arugula in a chardonnay and lemon sauce.